A change in weather and place is needed to overcome the monotony of daily life and drudgery. Vacations are perhaps the best time of the year to explore new places, enjoy the natural beauty and get lost in a new world. How nice would it be if you could forget about all your office work, your daily household chores and just focus on making memories in a new place? Christmas is a festival time when people are busy merry-making with their family and friends. To enjoy the perfect Christmas vacation, why not plan for a trip to some new places where you have never been before? Manali- This place is not just a favourite destination for movie-making but a perfect place to spend your Christmas holidays if you are fond of mountains and snowfall. Watching snowfall from your resort on the hilltop is describable beyond words. You can also enjoy adventure sports in Manali and marvel at the beauty of the Kullu valley while ice-skiing in Rohtang. Madhya Pradesh– If you are looking for a destination that is an amalgamation of natural beauty, wildlife adventure, leisure and spiritual places, Madhya Pradesh should be your ideal location. There are various tour packages for Madhya Pradesh that you can avail and land into this magnificent state to witness its wonders. The heritage places like Chanderi, Gwalior, Orcha and others, are notable for its rich historical backgrounds, forts, rivers, lakes and temples. If you have a wild soul, you can go for wildlife tours in the national parks and sanctuaries that the state abounds in. Should be looking for perfect spots to relax and unfold yourselves, places like Jabalpur, Pachmarhi, Bhopal and Indore should be more than what you expect. All these places are inexplicitly beautiful for the river(Narmada), marketplaces, forts, palaces and so on. In short, Madhya Pradesh is a place where the old meets the modern, where tranquillity meets the desolate. Rishikesh– This town in Uttarakhand is perfect for both the old and young. As it is a holy town, the grown-ups can visit the sacred temples and relax elsewhere also. The younger ones can go for adventure sports like bungee jumping and rafting to keep your adrenaline pumping! A little far from Delhi, this place is surely refreshing for your mind and body. Bhutan- Located in the North Eastern border of India, this place is also a popular tourist attraction throughout the year. Prepare yourself to experience peace to the real sense of the word and you will find serenity enveloping the monasteries and even the little houses on the hills. The unique scrumptious dishes and the spiritual beliefs and practices of the people over there will surely amaze you. Meghalaya– If you want a perfect introduction for the North Eastern part of India, Meghalaya is the place that you should start with. Cherrapunji, the place with the highest rainfall, is located in this place. Apart from the rains, the lush green hills, tea plantations, floating lakes, small meandering rivulets and many more features are sufficient to awestruck you. 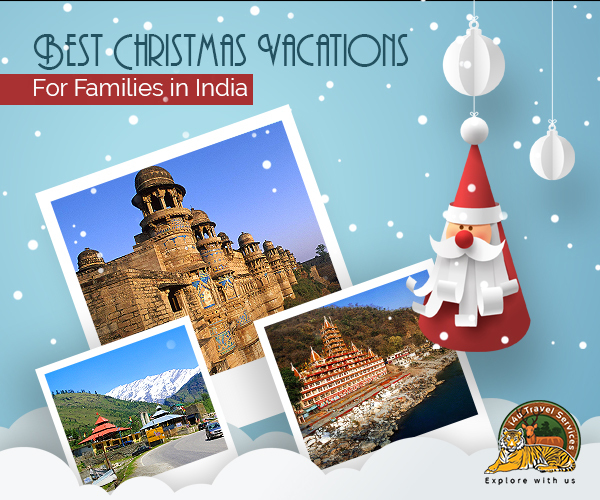 Conclusion– These places should stop your search for an ideal location to enjoy your Christmas with your family.